The 109th theme for FoodieMonday, Bloghop is On A Stick decided by the initiator of this group Waagmi who blogs at Cooking is Funn. Just a few days ago my daughter in law posted some photos of their visit to Kuala Lumpur. She showed us food stalls serving all kinds of food on sticks or skewers. While most appeared to be meat and fish based, I could make out a few sticks of veggie stuff. Serving food on sticks or skewers is fast becoming popular at Bars, Lounges, Dinner Parties, Cocktails,as Street Food as people don’t want to get their fingers dirty and food on sticks or skewers does look pretty, colorful and tempting. Just a few days ago I posted my paneer and naan bites. Its such a great way to enjoy tandoori paneer with tiny pieces of naan. For this theme, I was finding it difficult to choose what to make….. paneer lollipops, cauliflower Manchurian on sticks, fried baby corn, paneer tikka, even an ice lolly…that’s food on a stick. The days just passed by quickly and I hadn’t decided on what I wanted to make. The various ideas were still going on in my mind like a hurricane. Talking about hurricanes, Hurricane Irma has hit Florida as I type out this post. My sister in law and her family who live near Jacksonville were asked to evacuate to a safer place, which they have. Haven’t spoken to her much as they need to save battery life on their phones and they are safe. Living in a country that doesn’t get affected by hurricanes, tidal waves, storms, I don’t know how we would cope with such calamities. When you are asked to evacuate your own home, you carry only your essential papers and things. You’re not even sure whether your home will still be there or not after the storm is over! Your life’s hard work all gone in a matter of few minutes. While the people of Florida wait this disaster out, our prayers are with all of them and also to the people of all those islands in the Caribbean that got affected. With Hurricane Irma and an earthquake in Mexico, that region needs all the goodwill and prayers. Saturday morning I got up really early and instead of the usual hot porridge with fruits and nuts for hubby and my smoothie, I decided to make mini pancakes as I wanted to use the colorful fruits I had bought. 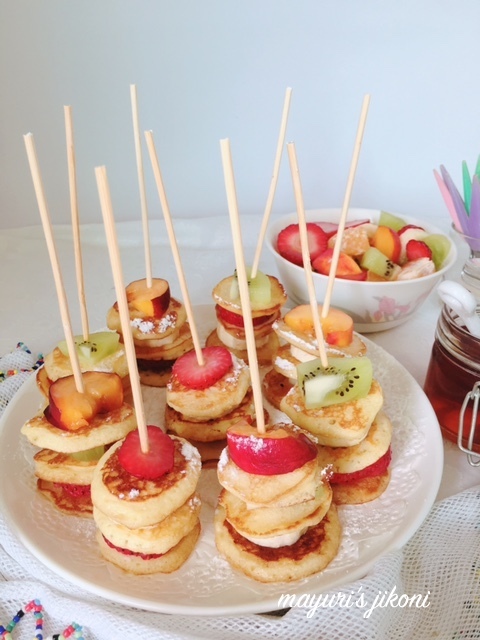 What I liked about this pancakes on a sticks was that you land up eating less of the pancakes and more of the fruit and yet you get the feeling you’ve had pancakes for breakfast. Confused at what I’m trying to get at? Well, just try out the recipe and watch your family scoff up tonnes of fruits all in the name of pancakes. Great brunch idea or even for a girlie party like baby showers, bachelorette parties. Who said pancakes are just for breakfast? Mix plain flour, salt, sugar, baking powder in a bowl. In another bowl whisk egg, milk and oil together. Add the liquid to the dry ingredients and whisk lightly just enough till the flour is incorporated into the liquid. Don’t over mix. Heat a frying pan or skillet over medium heat. Fill a squeeze bottle with the batter. Add a tiny knob of butter, swirl the pan around for the butter to melt. Squeeze out 5-6 small pancakes about 1″ in diameter onto the pan. As soon as bubbles appear, flip the pancakes. Cook till they are light golden in color. Repeat steps 6-9 till all the batter is over. Place a mini pancake on a chopping board. Stack up with fruit and pancakes as tall as you want. Push a skewer through it carefully. Repeat steps 1-2 till all the pancakes are over. Serve with maple syrup, honey or chocolate sauce. I served them with maple syrup. Use fruits of your choice. You can stack 2-3 pancakes together and then add a fruit. If you don’t have the patience to make mini pancakes then just make the pancakes the normal way. Cut them into wedges or squares and then stack them. Never seen such delicious innovation before!Absolutely wonderful and “to make” recipe dear! Such an innovative idea di..thanks for the share ! These look adorable and sound delicious!!! Loved the unique idea!! These are perfect for the kids breakfast. Wow Mayuri its a visual treat. Looks so beautiful and yummy. Excellent share. What a fantastic and innovative idea dee..love it…my kids will love this. So innovative. These super cute mini pancakes looks so delicious!! !